Last week, my brother and his longterm girlfriend entered these United States at JFK international airport in New York City. She’s a Chinese citizen with a tourist (B1/B2 visa), which leads to many restrictions on when she’s allowed to enter and for how long. They are always meticulous about playing everything exactly by the book, and this time was no different. The only unusual thing about this latest episode is his girlfriend happened to encounter an authoritarian and power-tripping U.S. Customs and Border Protection officer, who pulled her into a room and immediately began berating her. He accused her of breaking the law (she hadn’t), and forced her to hand over her phone and divulge her password. After initially refusing to provide the password, the officer threatened deportation, at which point she relented. Entering the password for access to the phone wasn’t enough, he forced her to write it down on a piece of paper. The officer then proceeded to scroll through her phone for 15-20 minutes, looking for who knows what. My brother was separated from her during this time. With his girlfriend still isolated in the room, the officer in question emerged and began barking at my brother to sit down in an extremely aggressive manner. The officer told him she had broken the law, at which point he assured him that she hadn’t. At this point, the officer became extremely agitated that a pleb had the nerve to challenge him, and lectured my brother about how he didn’t know the law, pointing out that he wasn’t an immigration lawyer so he couldn’t possibly know his rights. He then implied that the only reason someone would know their civil rights is if they’re a criminal with an intent to commit a crime. The officer also threatened to deport his girlfriend and deny her reentry for five years if my brother continued to challenge his false assertions. She was ultimately allowed to enter. Many of you will read this and think her experience was a result of not being a U.S. citizen, but the truth is far more disturbing. The border is seen by the government as a civil rights-free zone where U.S. citizens are being increasingly treated like criminals and subject to the exact same sort of degrading abuse as my brother’s girlfriend. This is something I’ve been meaning to write about for a while, and this recent experience inspired me to do so today. Many of you have no idea how bad things already are. One of the most disturbing and important articles I’ve read on the topic was published at Naked Capitalism a few months ago titled, Electronic Frontier Foundation and ACLU Sue Over Warrantless Phone, Laptop Searches at US Border. The Electronic Frontier Foundation (EFF) and the American Civil Liberties Union (ACLU) filed suit against the Department of Homeland Security (DHS), US Customs and Border Protection (CBP), and US Customs and Immigration Enforcement (ICE) last week on behalf of 11 travelers whose smartphones and laptops were subjected to warrantless searches at the US border. The plaintiffs in the case are 10 U.S. citizens and one lawful permanent resident who hail from seven states and come from a variety of backgrounds. The lawsuit challenges the government’s fast-growing practice of searching travelers’ electronic devices without a warrant. It seeks to establish that the government must have a warrant based on probable cause to suspect a violation of immigration or customs laws before conducting such searches. 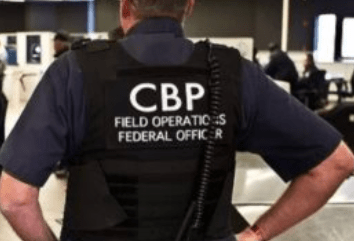 As the US Customs and Border Protection (CBP) outlines in a tearsheet it provides to people at the border, federal agents today can seize and search your phone, and even make a copy of it to have forensic experts analyze its contents off-site. “This isn’t rogue officers; this is the official, written policy of the US government,” Adam Schwartz, senior staff attorney with the Electronic Frontier Foundation (EFF) said in a conference call on Wednesday. Now, for even those with only a cursory knowledge of constitutional law, this must seem problematic. Doesn’t the Fourth Amendment to the US Constitution – which in theory protects against “unreasonable searches and seizures”– apply here? Particularly its warrant requirement– which I saw no mention of among the CBP bureaucratese. In a unanimous 2014 decision, Riley v. California, the Supreme Court held that police generally may not search digital information on a cellphone seized from an individual who has been arrested, in the absence of a warrant. Yet in cases such as the 1976 United States v. Martinez-Fuerte, the Supreme Court has chipped away at the Fourth Amendment requirements, articulating a border search exception. Consistently, therefore, with Congress’ power to protect the Nation by stopping and examining persons entering this country, the Fourth Amendment’s balance of reasonableness is qualitatively different at the international border than in the interior. Routine searches of the persons and effects of entrants are not subject to any requirement of reasonable suspicion, probable cause, or warrant, and first-class mail may be opened without a warrant on less than probable cause (citations omitted). All plaintiffs were taken to secondary screening where they were coerced into handing over their devices and, in some cases, passwords. This is all being done with zero articulable suspicion or probable cause. Agents imply devices will be returned sooner if those they’ve detained are compliant. But even complicity can result in citizens having to leave their devices in the hands of the government. In addition to the Fourth Amendment claim, the complaint raises a First Amendment claim. Out of the eleven plaintiffs, two are journalists, one a college professor, one a writer, and one a filmmaker. Government agents not only searched the electronic devices of the journalists, but questioned these individuals about both their sources and the content of their work. Am I the only one who finds this crazy? The U.S. government is effectively saying the fourth amendment doesn’t apply at the border, and CBP agents are increasingly compelling citizens to give the government their electronic devices to scroll through without a warrant or probable cause. This is truly insane and not remotely reflective of a “free” people. While we can hope the courts or public pressure ultimately puts an end to this practice, we can’t count on it. As such, it’s important to know what CBP officers cannot do. There are limits and you should know what they are. Excerpts below from The New York Times article: What Are Your Rights if Border Agents Want to Search Your Phone? American border agents have the legal authority to conduct searches at the United States border that a police officer on the street wouldn’t. Laws that allow agents to search bags without a judge’s approval, for the purposes of immigration or security compliance, have been extended to digital devices. But activists say inspecting a digital device is far more intrusive than inspecting a suitcase. They noted that the device can contain not just personal photos and messages, but could also compromise anyone else the owner may have communicated with. The policies that give border agents the latitude to search or seize devices were used under the Obama administration, to much criticism. There’s no available data to suggest that they are happening more under the administration of President Trump, though activists say they have anecdotally heard of more reports. A customs agency spokesman said the agency could not comment on individual cases. But he said agents had inspected 4,444 cellphones and 320 other electronic devices in 2015, amounting to 0.0012 percent of the 383 million arrivals. In fiscal year 2016, the searches of electronic devices rose to 23,000. Can agents force you to unlock your phone or laptop? No. But they can ask you to comply voluntarily and make the experience rather uncomfortable if you resist. Travelers must decide how much trouble they’re willing to put up with. What should you do if it happens to you? It’s an individual decision. As a matter of principle, said Robert McCaw, the director of government affairs at CAIR, people should not unlock their devices. And they should request a lawyer. But some activists said it’s understandable why some people comply to such a demand, depending on what they have to lose by resisting. Mr. Elsharkawi, who lives in Anaheim with his wife and three children, said requesting legal assistance appeared to inflame his situation. After allowing the Homeland Security officer to examine his phone, he said, he was immediately released. But remember, they hate us for our freedom.